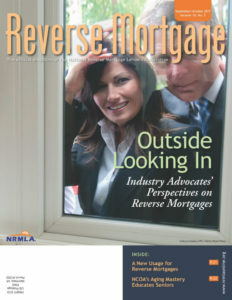 In the last issue of Reverse Mortgage Magazine, inspired by the 30th anniversary of the HECM program, staff writer Mark Olshaker interviewed a dozen industry pioneers and current leaders on how our industry got to where we are and where we are headed. For the September/October issue, Olshaker discussed the same topic with people outside the industry who have worked closely with us over the years—former HUD officials, journalists and academics. Among the interviewees was Jamie Hopkins of the American College of Financial Planning, who believes that a missing element in the national reverse mortgage conversation is an independent, third-party, non-biased research firm to help shape public policy. In other words, “a think tank focused on reverse mortgages,” wrote Editor Marty Bell in his introduction.